Changing your color is super easy. All you have to do is click on your name on the top right and then choose “Change Color” and change to a different color (both left and right click works). This also changes your seat location, but you can see exactly where you will be moving to if that affects your color choice. You can also join/change your team. If you are the host, you can change the color, team and many other options of each player. This is good if you need to make someone other than yourself the Game Master, then you would change their color to black. You can read about the different player roles here. 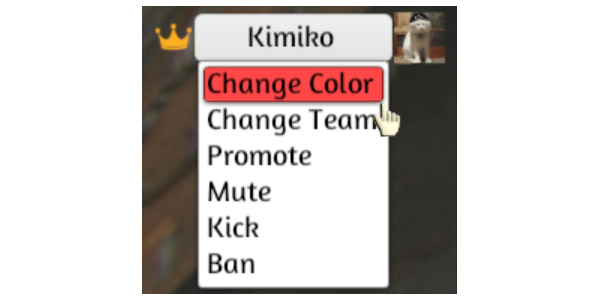 Please note that the host can turn off the change color option, in which case you won’t be able to choose a color if you join a server nor will you be able to change your color if you already had one. The only one you’d be able to choose is spectator as shown in the image below.